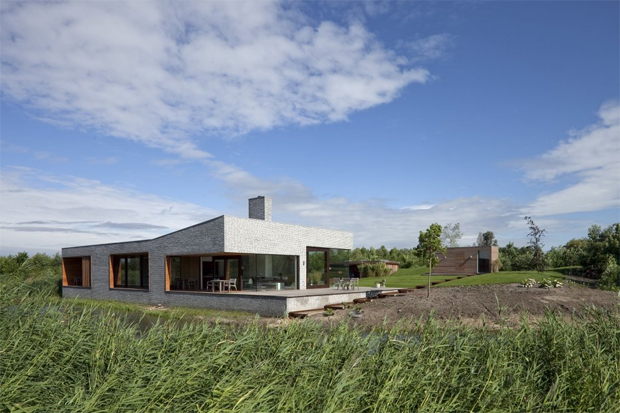 We head to Holland now, Lelystad to be specific through the work of 70F architects and this minimalist Villa that their team built two years back. 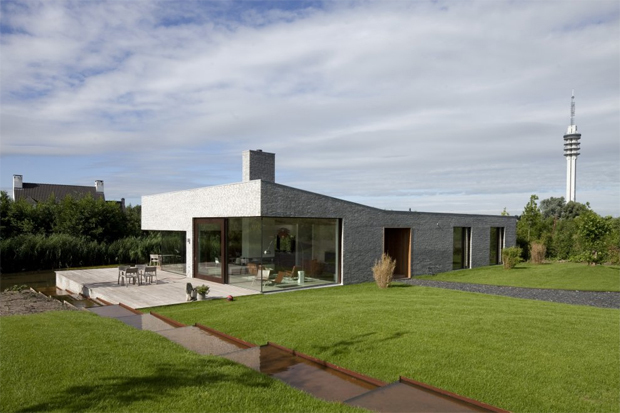 I can’t say I’ve come across their work previously but I really enjoyed this project all the same, browsing over their portfolio that spans twelve years back it would seem they often opt for a boxy exterior with large windows being the prominent feature of each build. 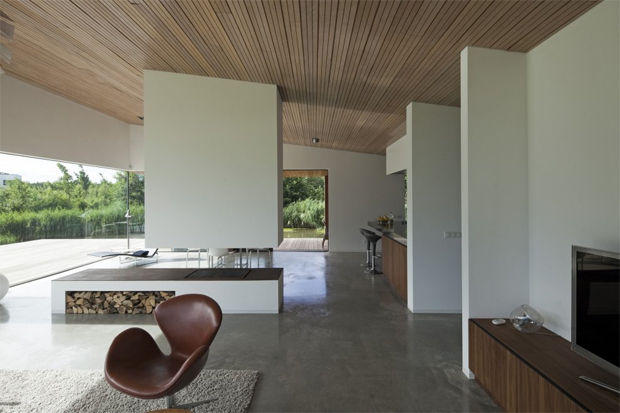 The open plan interior was what initially attracted me to the residential property however, with a great balance of living and dining found within the home. The fireplace is the only centre point that breaks up the lounge space which you can see below free hangs from the celling leaving the void to form the area for the fire. 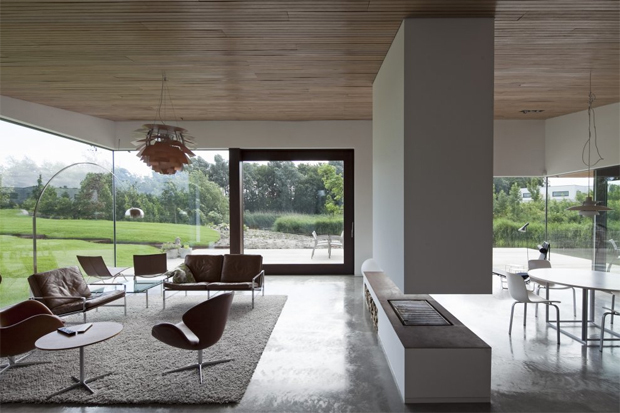 It’s quite a subtle addition that’s in keeping with the open plan approach yet still brings in a bit of room structure needed to form the dedicated areas. 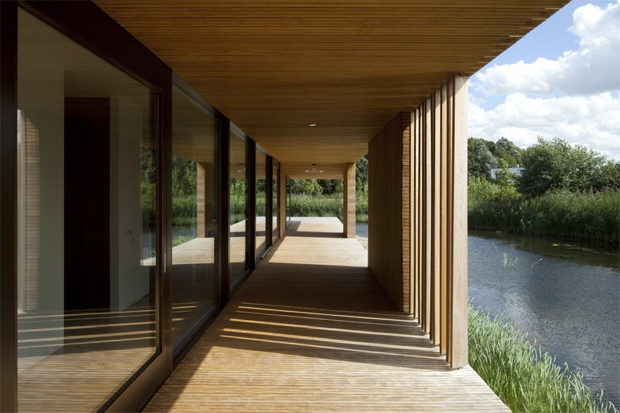 The single story bungalow was designed to incorporate the riverside environment which has been achieved through a veranda that covers the south side length of the property. I loved the water feature that has been created in parallel with the river too, this runs all the way down from that outbuilding that houses a sauna – seen best in the third image. I’m sure this would be great at the end of a tough day just before retiring to eat dinner outside by the view of the water. The water feature I felt was somewhat of a masterpiece as it helps you to consider the overall site as one enitiy. It also pays homage to the artificial hill that has been referenced in the slope of the house’s ceiling, another fantastic subtle touch. The 70F team have obviously gone to great lengths to study the site and maximise it’s potential for the owner. This place is a definite sun trap and I’m sure a real pleasure to live in. If you enjoy this style of home like me why not head across to the architect’s website and see what else they have designed and constructed in recent times.